America’s Got Talent Semi-finalists, Lightwire Theater! 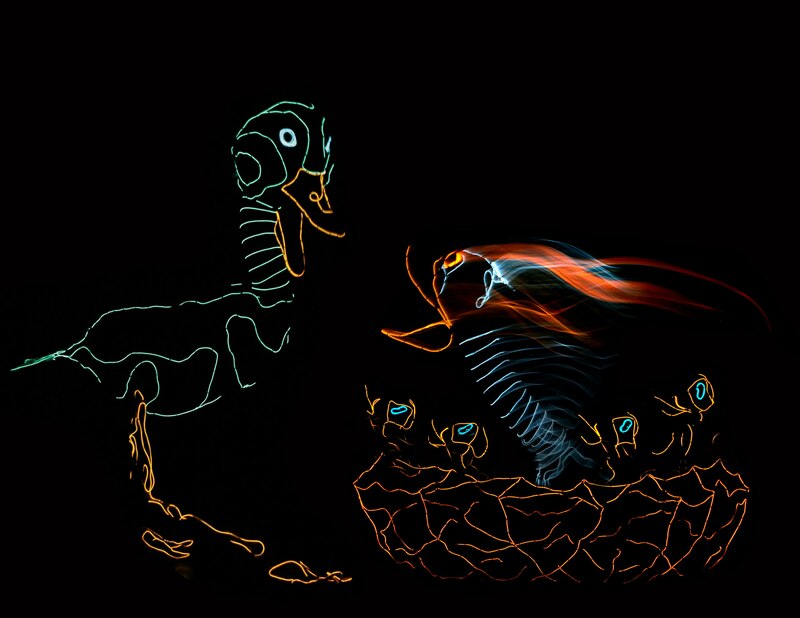 Click here to get tickets to see Lightwire Presents The Ugly Duckling on February 10 at 2:00 or 5:00 pm! Lightwire Theater is a much-lauded, totally unique, dance troupe that almost defies explanation. They blend handmade sculptures, electroluminescent technology, and classical dance all into one performance. Howie Mandel hit the nail on the head when he said, “You’ve gotta see this live” during Season 7 of America’s Got Talent. Now you do have the chance to see Lightwire Theater perform live on stage: right here in Torrance! Back in 2005, professional dancers Ian Carney and Corbin Popp met during the Broadway run of Twyla Tharp’s “Movin’ Out”. They became fast friends and found they had a lot in common. Not only did they share a love for the theater and dance, but also art and technology. Soon after the end of their show, they were introduced to something called electroluminescent wire, or EL wire – a battery-powered, neon glowing light. Suddenly they were awash with ideas for characters and shows. Carney and Popp teamed up with their wives, Eleanor and Whitney, and together they started to brainstorm and play with different shapes, designs, and structures. They ended up creating characters that seemed to leap off the stage, fully formed and three dimensional. Essentially, what Ian, Corbin, Eleanor, and Whitney created were puppets; giant, living, puppets. These puppet characters tell the story on stage through dance, movement, and a soundtrack. Each puppet is built from scratch, by the cast member who will use it, using household materials like signs, wheels, duct tape, and PVC pipes. Once the structure is right, black fabric is added for dimension, then lined with the EL wires. This is what gives the stunning, luminescent effect. Thanks to their unique, “spectacular” showmanship (as Sharon Osbourne said during the AGT semi-finals) Lightwire Theater was launched into the spotlight on national TV. They made it to the semi-finals on the 7th season of America’s Got Talent in 2012, the finals on The Best Le Meilleur Artiste in 2013, and they won TruTV’s Fake Off in 2014. Since their TV debut, Lightwire Theater has created many feature-length shows. Dino-Light (originally Darwin the Dinosaur), The Ugly Duckling, Moon Mouse, A Very Electric Christmas, and Lightwire: The Show. All of these are original stories with one exception: The Ugly Duckling. This classic Hans Christian Andersen tale is one known around the world for its message about inner beauty and the importance of resilience. “We chose The Ugly Duckling because the general public has a good idea of the story, but most people have not read the actual tale. This allowed us a lot of freedom when it came to the retelling of it. Most people know the story through Disney’s animated version, and not the Hans Christian Andersen original tale,” Ian told the Reading Eagle. Each of Lightwire Theater’s performances are dialogue-free, allowing the story to unfold wordlessly. Using a musical score that can range from classical music to rap, the audience is left to interpret what they see for themselves. This way, even the youngest members of the audience can still understand what’s happening on stage. But this show is meant to engage adults just as much as children. Lightwire Theater has created a show that both parents and kids can enjoy – through the stunning visuals, unexpected choreography, and musical score. “Theater is where the real magic happens,” Ian told The Journal Times in a 2013 interview. Come be a part of the magic! Don’t miss out on seeing the living, glowing, larger-than-life characters created by Lightwire Theater! They will perform The Ugly Duckling at the Armstrong Theater on Sunday, February 10, 2019, at 2:00 & 5:00 pm. Plus, bring the family early, or stay late, to do an art project with Art to Grow On! Get Tickets for Lightwire Presents The Ugly Duckling! America’s Got Talent Semi-finalists, Sara & Hero, Coming to South Bay Festival of the Arts! Fan Favorite Joel Gaines & Friends! At Page Turner Adventures, YOU are the Hero! Daniel Amat and a Celebration of Cuban Music!